These are ancient groves that are deeply revered by the communities that live in their vicinity. The groves, which are hubs of biodiversity, are called devara kadus, found largely in the State’s Kodagu region. The belief that people of the region have in these groves has ensured forest conservation. The concept of sacred worship of trees is unique and nurtures nature conservation with people’s participation and management. India’s first IG of Forests Sir Dietrich Brandis, who influenced and mentored Gifford Pinchot, the first chief of US Forest Service, recognised devara kadus of Kodagu in 1868. Every village in the district has at least one devara kadu. The tradition of tree worship has its roots in the Vedas, where the ficus tree has been described as housing the fertility spirits of the mythical gandharvas and apsaras. Over the years, Kodagu has lost more than 50 per cent of its devara kadu (755 in 1,900 to 346 at present) with a forest cover loss from 10,343 acres to 4,184 acres. Kodagu currently has an approximate 346 devara kadus spread over 4,184 acres. The size of the grove varies between one cent and 1,000 acres. For the nature-loving Kodava community, the devara kadu is a place of worship to appease its favourite deities. The drop in the number of devara kadus has been attributed to encroachment of the forest area for cultivation of coffee. While sacred groves are found all over the State, for instance, Bidirammana gudi (Tiptur), Salumaradamma (Tarikere), Hongelakshmi (Tumkur), Kadamba (dynasty of Mayuravarma who ruled Kodagu), the Kodagu district is special because it has a devara kadu in every village. Uttara Kannada, Dakshina Kannada and Udupi districts have naga banas in most villages. 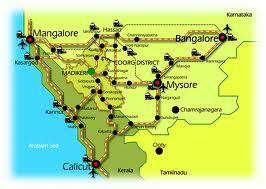 Kodagu is dominated by forests interspersed with valleys. In the west and north, there are peaks ranging from 3,800 feet to 5,724 feet high. The district is peppered with coffee, orange, cardamom and other spice plantations. Each devara kadu has a temple committee which conducts the annual devara kadu festival with participation from Kodagu families and the village community. The oldest devara kadu of Kodagu (dating back to 1,000 BC) is in Kolathode-Bygode en route to Hathur-Kaikeri in Virajpet taluk. The grove has a prehistoric cone-shaped menhir, about 12 feet high and five feet deep, another menhir ten feet high and three feet deep and a dolmen with a U-shaped porthole near the menhirs. In Yedur and Choudlu in Somwarpet taluk, in the ajji bana (ancient grove), stones are arranged in the form of capstone with stone circle, which is a megalithic practice, for worship even to this day. This is held during the suggi katte festival. At the foot of the big menhir, a stone axe dating back to the Neolithic era, is still worshipped. An open well, about 50 feet deep, has been dug to meet water needs during worship. The menhirs are unique when compared to the menhirs at Heggadehalli and Doddamolathe in North Kodagu. For, villagers are known to have offered earthen images, such as that of a dog, child, horse, elephant and other forms to appease the deity, a prehistoric practice. During 1990, a compound was built around both the menhirs by Muruvanda family with the help of Kelappanda, Maletira and Chappanda families. At present, the deva thakka responsibility is shouldered by the Muruvanda family. The name Kolathode-Bygode indicates existence of a rivulet Golagundi joining the river Barappole (as thode implies rivulet). The tradition of devara kadu conservation by Kodavas is very closely linked to their family festivals, both involving the appeasement of the same deity. The festivals are known as karana kodupa, puttari, kailpod and Cauvery Sankramana (theerthodhbhava). As part of the karana kodupa ceremony, the head of the family and relatives assemble in the Iyenmane (ancestral home) to offer meedi (food) to the ancestor/s. In Puttari, the harvest festival, the first harvest of paddy crop is offered to the karana (ancestor) seeking a good harvest. In the kailpod or kailmurtha (upon transplanting paddy), hunting weapons and agricultural implements are worshipped. In the Cauvery (Tula) sankramana, river Cauvery, the goddess of Kodagu is worshipped, as Cauvery takes its birth in the Brahmagiri hills at Talacauvery. The size of the devara kadu is not crucial, but the code of forest conservation that every community or village in Kodagu teaches by way of preserving its devara kadus is a key lesson for the world. Each devara kadu has three common features: the deity, the temple forest and the sacred tank. Tree diversity as well as ancient trees are high in sacred groves attract diverse flora and fauna. In recent times, silver oak, an exotic tree from Australia is becoming a popular shade-giving tree in coffee plantations, because planters need not obtain felling permit from the Forest Department. This however is affecting diversity of flora, fauna and contributing to climate change. It is crucial that the Forest Department takes the initiative to demarcate devara kadus as devara kadu reserve forest and not merely as ‘reserve forest’ in the forest / land revenue records, as this practice will protect devara kadus from gradual loss. A survey of all devara kadus is necessary to demarcate, preserve and protect devara kadu area and numbers. The Forest Department and all the temple forest committees which met under the leadership of Prof CG Kushalappa of Forestry College, UAS Ponnampet have the potential to jointly protect this unique tradition of forest conservation, and hold it as a shining example for the world to emulate.